Yuzu Ceviche at Shun Japanese Kitchen in Houston. Photo by Kirsten Gilliam. Naoki Yoshida says he has been cooking authentic Japanese food for 18 years. The Houston native and second-generation Japanese-American worked at his family’s sushi restaurant, Nippon, starting when he was only 15. Since then, he has honed his craft by training in Japan, Chicago, Los Angeles and Miami. Now, Yoshida is bringing his take on the simplicity and artistry of authentic Japanese cuisine to his hometown. Shun Japanese Kitchen opened in October at 2802 South Shepherd in Montrose and is the young sushi chef’s first foray as a restaurateur. He shares the kitchen with executive chef Nick Hill, who was previously a sous chef at now-closed Triniti. The nondescript grey building is easy to miss — but worth the hunt. Once inside, guests are greeted by a minimalist Japanese design with bold, modern touches. 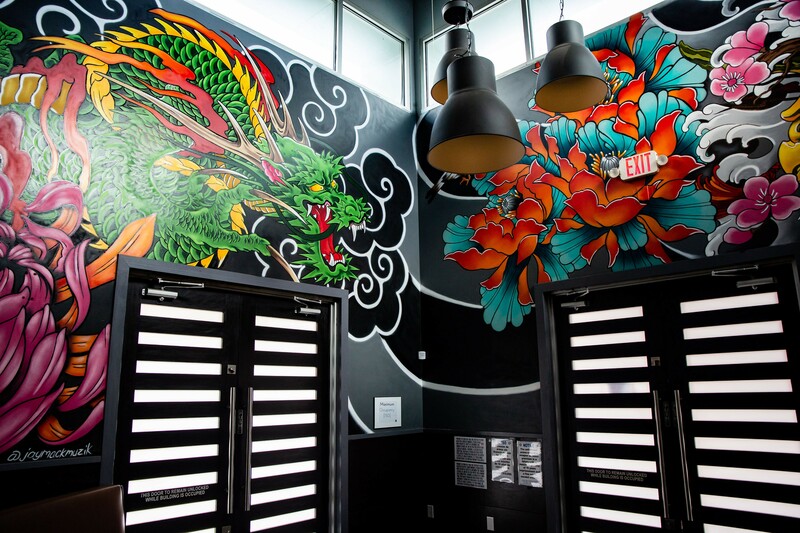 There is a massive mural in the style of Japanese tattoo art covering the walls of the entryway that adds intense color to the otherwise muted interior. The intimate dining area seats about 70 guests and the sushi counter accommodates an additional six. Shun’s tattoo-inspired mural by Jay Mack Muzik. Photo by Kirsten Gilliam. 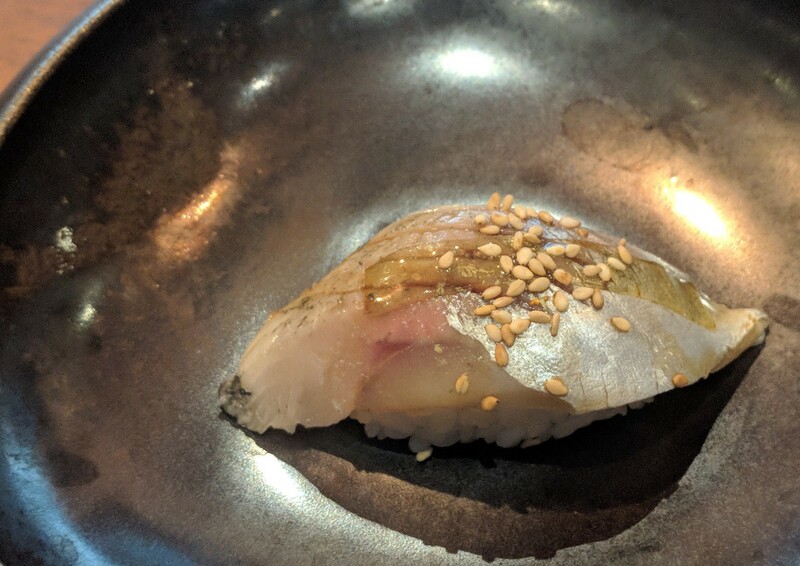 Houston Food Finder was invited in for opening night (and you can read more about our first impressions in our October Hit List) then invited back for a full meal of Yoshida’s handmade sushi and Hill’s larger menu of hot and cold dishes. The goal of the sushi program at Shun is to allow high-quality ingredients to shine without interference or complication. Yoshida follows the traditional Japanese style of preparing rolls and hand-pressed nigiri behind the counter in view of guests. He forms the delicate cuts of fish around mouthfuls of soft, warm rice one bite at a time. The sake toro, or fatty salmon, is a lightly seared piece of salmon belly sprinkled with sesame seeds and gently brushed with soy sauce. The fish is buttery and flaky with mild hints of salt and umami from the soy sauce. It highlights everything salmon should be in a way that can be an unfamiliar sensation in a scene where chewy happy-hour rolls slathered with mayo are ever-present. The thinly sliced, marinated house mackerel has the characteristic shimmer of silver skin and is topped with a translucent slice of seaweed seasoned in sugar and vinegar. Unlike the salmon, the mackerel is more acidic but no less tender. The seaweed adds a note of sweetness while the vinegar adds bite. Both of the above nigiri are superb, and yet somehow pale in comparison to the bluefin tuna. The tuna is marinated overnight in soy sauce and topped with just a dash of spicy wasabi. Like a butterflied filet mignon, the fish melts in your mouth and is complemented by the pillow of soft white rice. All of the sushi is accompanied by palate-cleansing ginger that is marinated in-house in apple-cider vinegar. In the meantime, Hill is preparing a number of dishes. 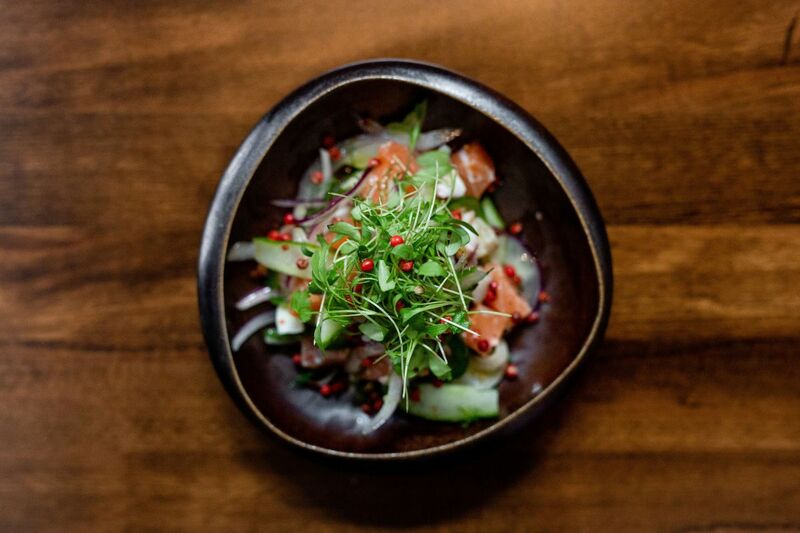 The Yuzu Ceviche features salmon, octopus, cilantro and wasabi foam. The Seasonal Tempura Plate includes whole Gulf shrimp and a soft-boiled tempura egg. Both dishes reflect the dichotomy of Shun’s commitment to traditional authenticity and exploration of contemporary flavors and techniques. 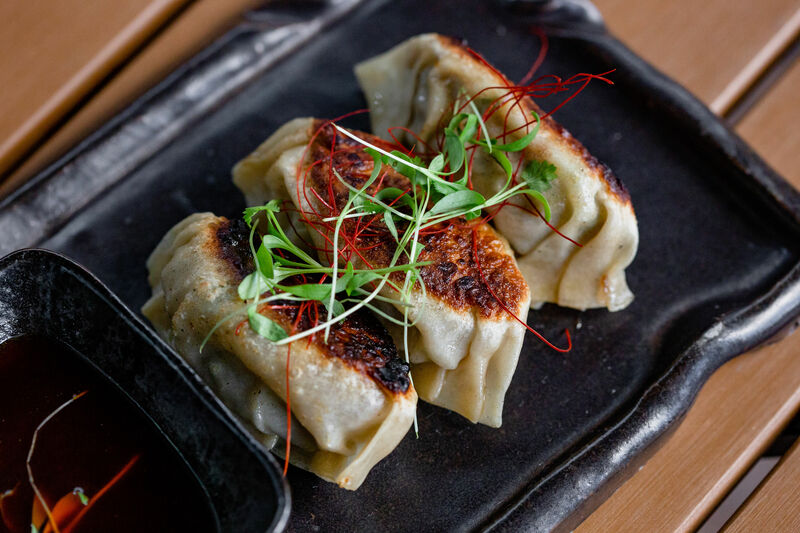 In terms of modern creativity, the highlight of the Shun menu is the Carnitas Gyoza pork dumplings. The house-made dumpling skins are filled with oven-baked shredded pork, cabbage and garlic chives. They are fried to crispy perfection and served steaming hot straight from the frying pan. The carnitas dumplings are the only regional fusion dish on an otherwise authentic Japanese menu. The Samurai Warrior platter at Shun allows a group of four diners to craft their own sushi experience. Photo by Kirsten Gilliam. The Samurai Warrior is another showstopper dish. 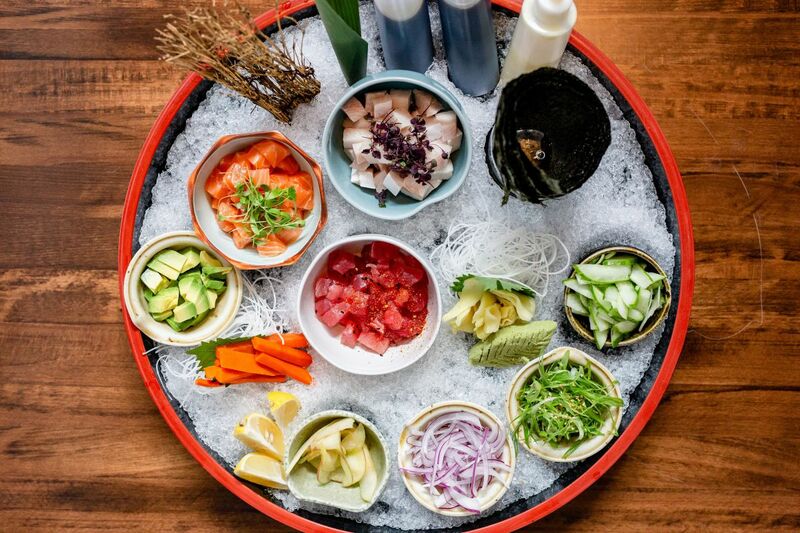 The platter, which features raw ingredients such as salmon, akami tuna and fresh vegetables, offers the first DIY sushi experience in Houston that allows diners to create their own nigiri and rolls. The unique, hands-on platter serves four and is $150. For dessert, few dishes in Houston can top the creativity and quality of Shun’s Japanese Shaved Ice. 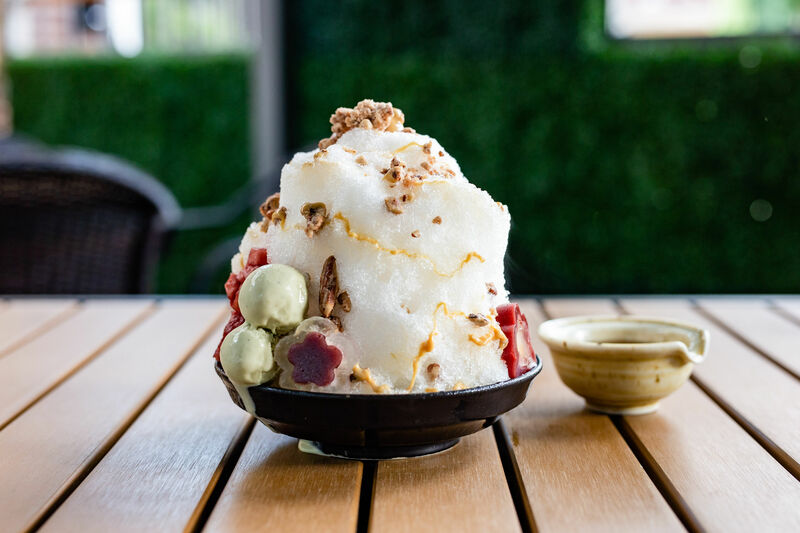 It arrives as a frosty mountain doused in sake syrup and garnished with small scoops of creamy green tea ice cream, red bean paste, candied apple cubes and more treats. This dessert is almost too stunning to consume. The rich syrup is a sweet reduction of sake flavor that creates a snow cone texture when poured over the finely shaved ice. For now, the restaurant is operating on a BYOB basis but according to Shun’s Instagram the full beverage menu launches on Friday, November 23 to coincide with the restaurants Grand Opening featuring an all day happy hour. Once the beverage program is up and running, Shun plans to be Houston’s largest sake bar — and the only bar to offer exclusively Japanese spirits, wine and beer. The forthcoming selection of Japanese whiskies is rumored to be unrivaled. Shun is already shaping up to be one of Houston’s best new restaurants of 2018. Though in its infancy, this authentic Japanese kitchen is a much-needed addition to the city’s culinary landscape. With a sushi program that honors tradition, a full menu of inspired Japanese dishes and a bar program geared towards exclusive Japanese spirits, Yoshida’s establishment is already a gem of Houston’s food scene. Shun is open Tuesdays through Saturdays from 5 to 10 p.m. and Sundays from 5 to 9 p.m. It is open for lunch on weekends from 11 a.m. to 3 p.m.